Wood fences are beautiful when new, but prolonged exposure to the elements and buildup of dirt and mildew cause unattractive graying. The good news is that with some hard work and time you can restore your wood to like-new appearance. Here's how to refinish an old fence. Begin the refinishing process when there is no rain in the forecast for several days. This will allow your newly stained and sealed fence to dry thoroughly. Clean the fence with a pressure washer. Depending on the extent of discoloration and presence of mold and fungi, you may need to use a chemical wash. The pressure washer will remove the thin layer of wood cells that gives your wood an aged look. 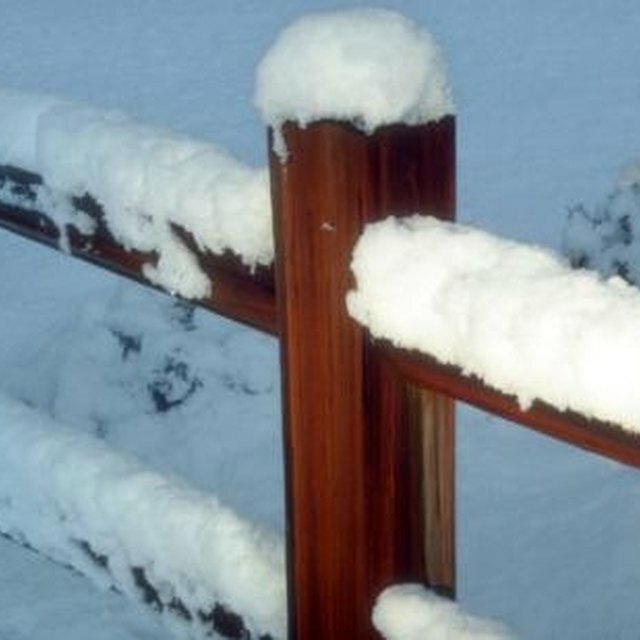 Repair broken or splintered fence posts with wood glue and corrosion resistant nails or screws. You may need to replace some pieces of wood, so if you aren't sure what your fence is made of, take a small sample with you to the wood supplier. Cover the ground below the fence before staining. Use newspaper or plastic to cover grass and plants that grow along the fence line. You may also want to place painter's tape over metal gate hardware and accents to avoid exposure to stain. Apply stain to the fence using a paint roller and smaller brush for nooks and crannies. Use a stain that contains a sealant and UV inhibitors to protect the wood from sun and water damage. Prolong your fence's life by cleaning and refinishing the wood regularly. Your fence will look better and you'll save money in the long run. Allow your fence to dry completely after washing before applying stain. Sealing in moisture will speed up processes that age and damage your wood. Apply stain in the direction of the wood grain for best results. Wipe any dust and debris from the fence to ensure proper adhesion and absorption. If you use a chemical wash on your fence, exercise extreme caution and follow the manufacturer's instructions for use. Acid-based washes are particularly toxic and are best handled by professionals with special equipment and protective gear.